No less than four new species turned up at this session! At Finca Cantaros we caught a Squirrel Cuckoo, surely one of the most striking birds in the country with a glamorous black and white tail. Often, Squirrel Cuckoos give loud wolf whistles when they land on a tree branch and they are known for scurrying through trees like squirrels. At 18”, they are two inches longer than Blue-crowned Motmots. At Finca Sofia, we netted an Emerald Toucanet; however, we did not have the correct band size for this species. Alas, we had to release it unbanded after all appropriate data were taken. Another one remained above the banding station, calling incessantly, while we worked. We cannot help but conclude this was a mated pair! At Finca Corteza, we netted two new species. The first was a bird that has had both common and scientific names changed recently. In the original Stiles and Skutch field guide, it was called Whistling Wren (scientific name: Microcerculus luscinia). This changed to Scaly-breasted Wren (scientific name: Microcerculus marginatus) in the more recent Garrigues and Dean guide although the author points out the Costa Rican race has no scaling on the breast. The song is described as “remarkable” in S&S with short, fast ascending notes followed by a long (2-4 minutes) series of piercing whistles. Once heard, it is unmistakable. 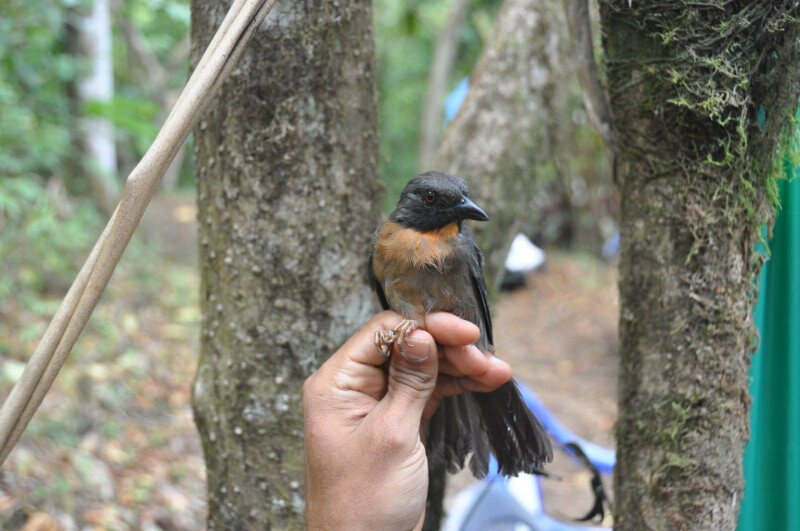 Finally, to our surprise, we caught a Black-cheeked Ant-Tanager, a Costa Rican endemic with a limited range restricted to the Golfo Dulce and Osa Peninsula region. Interestingly, Stiles and Skutch had this to say, “. . . increasingly scarce as its forest habitat is reduced; still fairly common . . . where forest remains , but within a few years the entire population may be confined to Parque Nacional Corcovado.” Those familiar with the southern Pacific lowlands will realize what an altitudinal change it represents to go from sea level there to approximately 4,000’ in San Vito. Consequently, we plan to write a short paper on this discovery for submission to the Asocacion Ornitologica de Costa Rica’s journal, Zeledonia. Finally, we netted four “foreign recaptures”. These are birds banded by other researchers. Two of them, a Violet Sabrewing and a Green Hermit were caught at Finca Cantaros. Another Violet Sabrewing was captured at Finca Sofia and the last one, an Orange-billed Nightingale-Thrush, came from Finca Corteza. We have sent the band numbers, date, location and species name to the Stanford University study group and will also report this information to the Banders Network of Costa Rica. As always, we want to express our thanks to our Principal Investigator Steve Latta, project founder Judy Richardson and our San Jose-based team of trainers including, at this session, Jorge Leiton and Sara Estrada. This entry was posted in Mist-Netting Session Highlights by AWOlivieri. Bookmark the permalink.